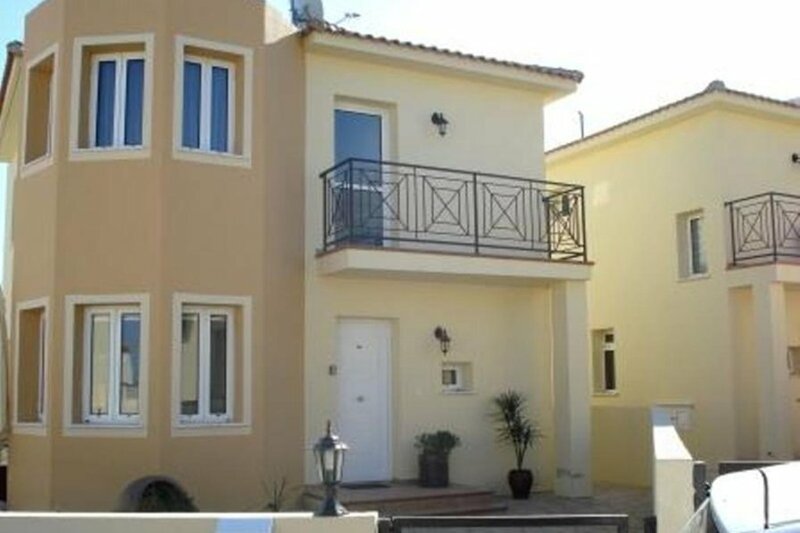 New villa in a secure development, close to the beach and all amenities. With patio, barbecue area and outdoor furniture to enjoy eating al fresco. Villa Crown is a brand new, luxurious three bedroom villa in a peaceful location situated in an exclusive gated development in the heart of Pernera. It is the ideal family villa just a few minutes walk away from a superb range of shopping facilities, bars and restaurants and with 2 lovely sandy beaches within 3 minutes walking distance. This villa has air conditioning throughout and is fully furnished to a high standard with stone tiling, granite worktops, flat television, satellite and full indoor entertainments system (including a games console). Outside has a full set of patio furniture for dinning/barbecue. Around the villa are numerous well known resorts with communal swimming pools and children's pools that can be used by all guests. There are also reasonably priced, good quality restaurants around with open plan beach bars serving hot and cold drinks. They all offer Wi-Fi. There are also sun beds along side the facilities and these are placed on a grassed area stretching down to the beach also can be used by our guests. This elegant luxury villa is ideally located 200 meters from a beautiful sandy Pernera beach where lots of activities are within easy reach. Villa Grown is well organized so that you feel immediately welcome. It has its own private swimming pool 7 x 3 meters and spacious outdoor area for you to relax and soak up the sun or entertain your friends and family with a BBQ party. It comprises of large living area, shower/toilet room, bathroom, guest toilet and three bedrooms to comfortably accommodate six persons. The villa has 3 bedrooms all upstairs; two are with double beds and one with 2 single beds, all inbuilt wardrobe space. There are 2 bathrooms upstairs and 1 toilet downstairs. One of the bedrooms has en-suite. The villa is fully air conditioned, furnished and equipped with all modern appliances such as flat TV, Satellite, DVD player, Play station, Home Cinema, selection of DVD film and games. The villa has a specious ground floor open plan setting with the kitchen, dining and lounge area, fringe/freezer, cooker, microwave, toaster, kettle, dishwasher, washing machine, ironing facilities, oven, extractor fan, all cooking utensils. The lounge area is tastefully furnished with comfortable sofas, and coffee tables. The inside dining area can be used for happy family meals, and can seat up to 6 people comfortably. The garden area comes complete with a private pool and sun loungers, a garden table, and chairs. The garden is bordered and fenced, which create a pleasant feeling of seclusion. All necessary bed linen and bath towels are provided and with respect of your privacy, pool cleaning service is provided twice a week free of charge. Additional services are available on request. The villa is designed to ensure top quality and comfortable stay on your holiday. The villa is located in one of the most attractive resorts of Cyprus. A couple of minutes walk you will find the holiday village of Kapparis with bars, excellent taverns and restaurants, supermarkets, banks, kiosks and car hire rental offices. Larnaca airport is about 40 minutes drive from Villa Crown. Ideally situated and equipped the villa offers pure relaxation and family-orientated holiday on one of the most attractive Cyprus beaches. Just beyond Protaras is Cavo Greco, which is located on the furthest southeastern point of the island in the Famagusta region. This area contains a National Park Forest, occupying an area of 390 hectares and offers facilities for hiking, picnicking, cycling, horse-riding, climbing, swimming and diving. Scenery and views in this area are some of the best on the island.